With his sharp eye and gentle wit, Noah Adams doesn't just tell stories, he lets them unfold quietly, powerfully, and eloquently. Now the beloved host of NPR's All Things Considered and bestselling author of Piano Lessons takes us on a river journey through the heart of Appalachia--a journey shared by pioneers and preachers, white-water daredevils, bluegrass musicians, and an unforgettable cast of vivid historical characters. Noah Adams has Appalachia in his blood. A native of eastern Kentucky, he comes to the headwaters of the New River not just in search of adventure but to better understand his own unique heritage. Following the New River from its mile-high source on North Carolina's Snake Mountain to its West Virginia mouth, Adams travels by Jeep and by bicycle, by foot and, most thrillingly, by white-water raft to explore the history, natural beauty, and fascinating characters waiting around every bend and turn. Distilling history from legend, Adams tells of men and women whose lives crossed the New River before him: Daniel Boone, fleeing his farming family in search of wilderness; Cherokee Indians driven west on their Trail of Tears; and the ill-fated men who traveled thousands of miles to work on the Hawk's Nest Tunnel, making a fortune for a company while their lungs filled with deadly silica dust. And along the way Adams follows the echoes of his own distant heritage, interweaving his river journey through Appalachia with yet another voyage, thousands of miles away. With eloquence and compassion, Noah Adams paints a luminous portrait of a land and a people as richly vital and complex as America itself. At the same time, his quietly personal chronicle captures the sheer magic of the flowing waters: their sound, their eddies, their utter unpredictability. 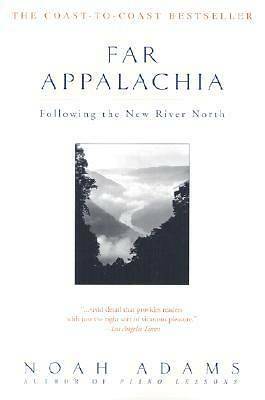 A vibrant and unforgettable read, Far Appalachia mesmerizes and haunts like the bluegrass music that still rings through the mountains and valleys in which it was born.